Police attended a head-on crash at Marholm just outside Peterborough after a motorist attempted an overtaking manoeuvre on a bend. Police were called to reports of a two vehicle collision in Walton Road, Marholm yesterday, Tuesaday January 16, at about 2.15pm. The vehicles involved were a silver Peugeot 107 and a blue Ford Focus. 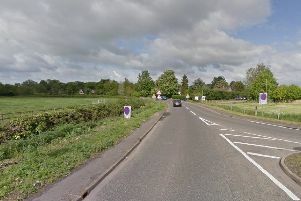 Police at the scene tweeted: "On a bend is not where you should attempt to overtake. Luckily nobody is seriously injured in this collision. #Think #DriveToArrive." The road was reopened at about 5pm.